Since the first electronic organ was built, the goal builders have been to duplicate the sound of pipe organs. The technology began as analog tone generation, which could produce musical results, but was not capable of creating the complex wave shapes of windblown pipes. Technology took a giant leap forward in 1971 when Allen Organ Company introduced the world’s first digital organ. Other builders followed with digitally-based instruments in latter decades. These early digital organs offered significantly better tonal results than those using analog technology. However, due to the limitations of processing power and memory, early digital organs could not produce some of the important nuances of a pipe organ. Their acceptance was based on improved sound, less maintenance than pipe organs, and a significant cost advantage. Tone generation technology has made giant gains. In recent years, hundreds of combination organs have been installed that include digital stops and pipe stops played in the same buildings. Most listeners cannot determine which stops are produced by pipes and which are produced digitally. Such installations offer the gold standard for proving a builder’s tonal capabilities and the quality of their instruments. Below are links to videos of a combination organ installed at Hedvig Church, Stockholm, Sweden. One video presents only the pipe stops played. In another, the same music is played only on Allen digital voices. Finally, a video includes music with both the pipe and digital voices played together. 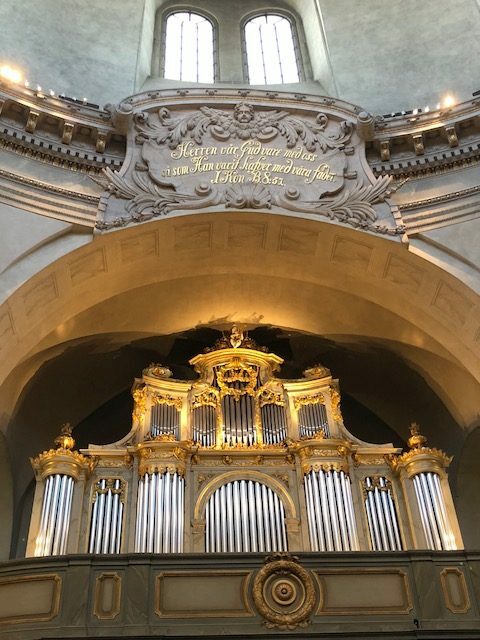 The combination organ at Hedvig Church has convinced listeners that an Allen digital organ can not only reproduce the sounds of a fine pipe organ, but also that its digital voices can be voiced in a way so that they are seamlessly part of the pipe organ specification. There are those who believe there is no alternative to a fine pipe organ. Missing from this conclusion is an important question: Is it reasonable to pay millions more for any differences detected between the digital and pipe voices in Hedvig Church? As Larry Phelps once said, we’re at the point where digital can perfectly replace all of the defects in the pipe organ, Larry was past president of Casavant, and later the Phelps Organ Company. He ended his career at Allen and he lived and breathed organs his entire life — do search for his papers. His last project was finishing the work he started on the Mother Church organ in the 1950’s, it was the 1990’s. I was honored to call him my friend. Which by the way the Mother Church Spent Millions and decades reversing the damage Phelps did to that instrument. First any person willing to approach/consider this topic should not let their emotion get out of control. Then, with most churches struggling to financially keep afloat, Stewardship of the Funds should be the major consideration when considering the ‘organ question’.